Week 3 of the Calling It Home ORC is here, and that means it is the half-way point (a.k.a. time to freak out). Highlights this week: The floor is done! It is perfectly in place and looks gorgeous. And, we have a door! Yay for bathroom privacy. Lowlights this week: Subway tile freakout, and grout is the devil. Our marble mosaic 2" hex tile went down super smoothly. Ryan cut it and laid it down all before 4 pm on Saturday. He was pleasantly surprised at how easy the wet saw was. The next evening, however, when it came time to grout it...oh brother. That stuff is the worst! We were up until midnight trying to wipe it down every ten minutes, only to have the grout haze come back. We could not get it off! Finally by wipe-down #6,074 it started to look like you could see the tile. We literally spent 24 hours just going over it with a damp sponge every few minutes to every hour, trying to get the grout off. I am SURE we did something monumentally wrong that caused us this grief (I know what you're thinking, but yes, we did seal it first...twice!) and honestly I'm so tired I don't even care to investigate what that was. All I know is that it's finally done, and thank goodness! The door went in much more easily. This room is so small that we could only fit a 24" door. It's so cute and tiny! I have to buy door trim before we can start wall tile, and I'm debating whether fat trim will make the door look even smaller, or if it will make it look bigger like hanging tall and wide drapes on a small window. On the wall-tile-freak-out-front, I am having a hard time deciding whether to use plain subway tile without any trim, or to add a skirt and cornice (fancy words for a baseboard made out of tile-- the skirt-- and a decorative trim piece at the top-- the cornice). The plain subway tile was the original plan and would be a more modern treatment, which would be nice in a room that has a lot of "fancy." Everything is so traditional, from the faucet to the sink style to the sconces, that it would be good to keep the tile simple and sleek. And yet I'm so drawn to the tile with trim! Naturally, to get tile with trim I'd have to abandon my cheap Home Depot subway tile (it doesn't have any trim options that will match the off-white color) and start over with another manufacturer. 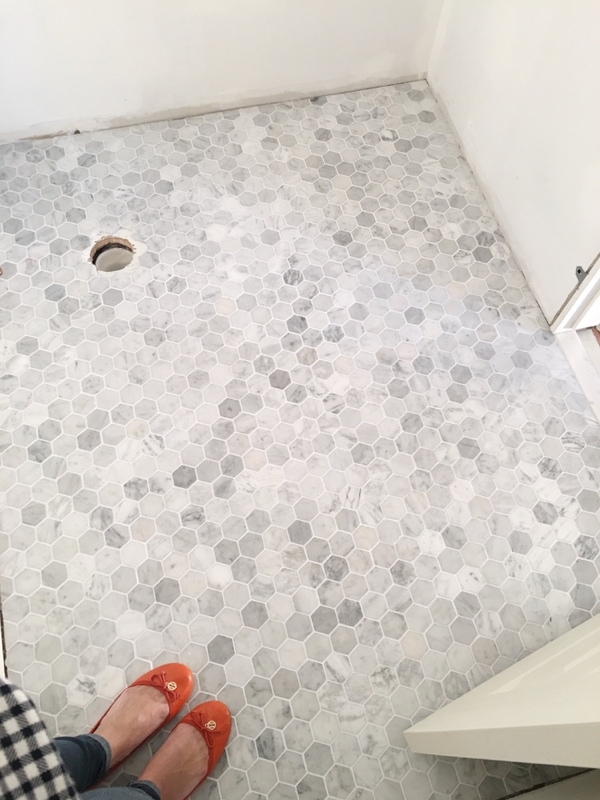 I've already priced it out from The Tile Shop and at $15 EACH just for the 8" skirting pieces, that is a splurge we definitely don't have left in the budget. So, I have about one day to decide if I'm going to stick to the plain plan, or go looking for other options. I am sensing a road trip over to Virginia Tile in my day tomorrow. Well, that's the quick recap from this week! Head on back over to Linda's to see the rest of the Guest Participants and we'll see you back here next week!